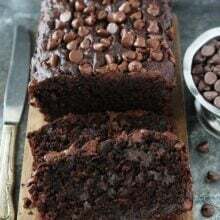 Chocolate Banana Muffins-these rich and fudgy chocolate banana muffins are vegan, but you will never know it! They are healthy enough for breakfast, but good enough for dessert! We usually eat oatmeal or smoothies for breakfast, but every once in awhile I mix things up and let the boys have a special breakfast treat. Over the weekend, I wanted to earn extra mom points so I made Chocolate Banana Muffins for breakfast. Chocolate for breakfast. I like the sound of those words. I think I would jump out of bed every morning if I knew chocolate was on the breakfast menu. 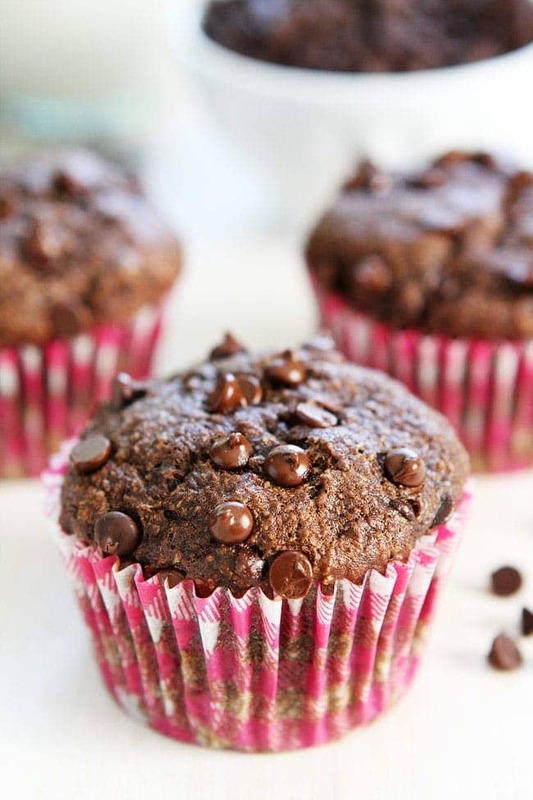 Just don’t tell anyone that these chocolate banana muffins are on the healthier side! Don’t worry, you will never know it because they are SO delicious! When Caleb saw the muffins sitting on the table he asked if they were for breakfast. When I said yes, he started jumping up and down…and then he stopped. He looked up at me and said, “Do you have take pictures of them?” Ha! He knows me too well. I already snapped my photos so the muffins were ready to be eaten. The boys were super excited! 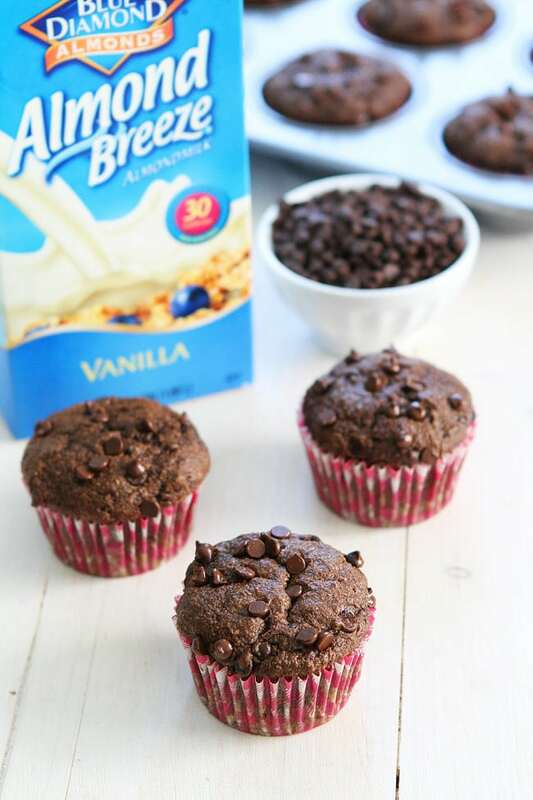 The muffins are vegan and made with white whole wheat flour, cocoa, mashed bananas, coconut oil, and Almond Breeze Almondmilk Unsweetened Vanilla. I always keep a few shelf stable Almond Breeze Almondmilk containers in our pantry because it comes in handy whenever I want to bake! 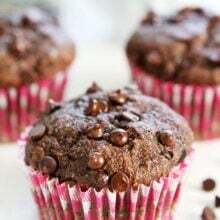 I added vegan mini chocolate chips to the muffins because they are super cute and extra chocolate is always a good idea! Double chocolate muffins are even better! If you need the muffins to be gluten-free, you can use all-purpose gluten-free flour. I have made them this way and they are great too! To freeze the muffins, make sure they are completely cool and place them in a freezer bag. Freeze for up to 2 months. You can defrost on the counter or reheat in the microwave for about 25 to 30 seconds. 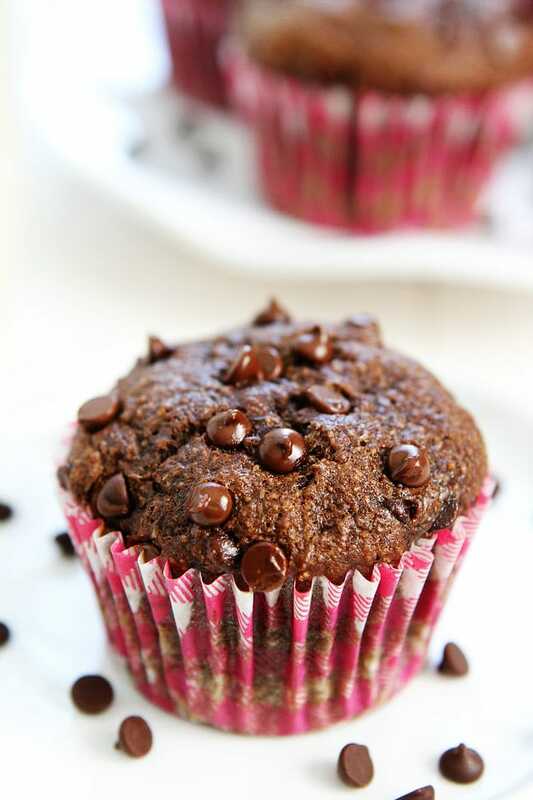 These chocolate banana muffins make a great special breakfast, snack, or even dessert! 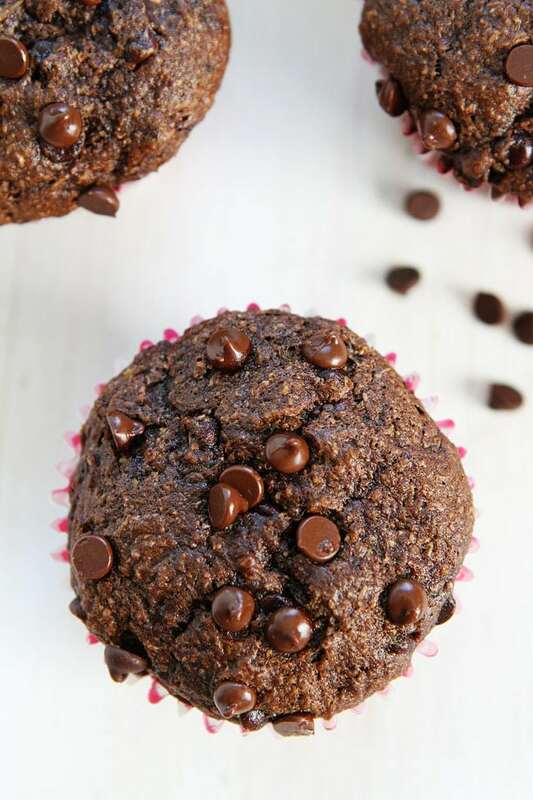 Your friends and family won’t ever know these chocolate banana muffins are healthy, they are such a treat! Chocolate for breakfast? YES! 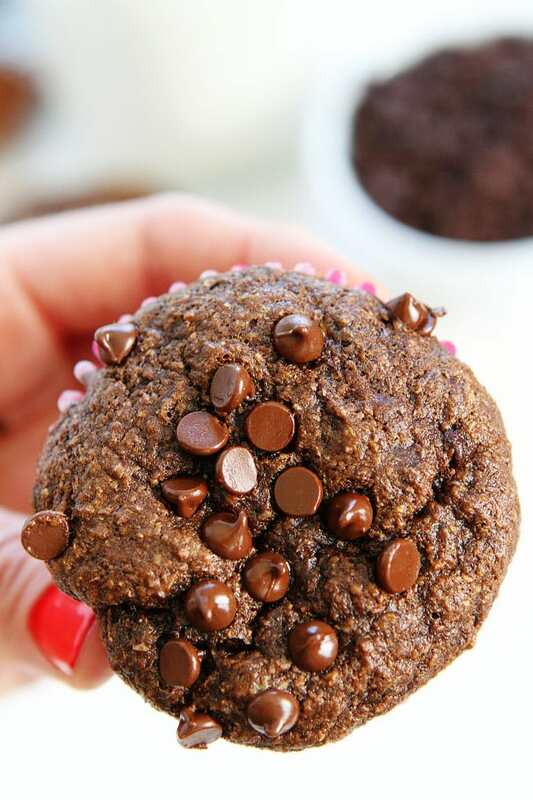 You will never know these chocolate banana muffins are healthy because they are SO good! Preheat oven to 350 degrees F. Line muffin tin with paper liners or spray with cooking spray. Set aside. In a large bowl, whisk together flour, sugar, cocoa, baking soda, baking powder, and salt. Set aside. In a medium bowl, stir together mashed bananas, coconut oil, almond milk, and vanilla extra. Add the banana mixture to the dry ingredients and stir until combined. Stir in 1/2 cup of the mini chocolate chips. Spoon batter into prepared muffin cups. Sprinkle remaining mini chocolate chips over the tops of each muffin. Bake for 18-20 minutes or until a toothpick inserted in the center of a muffin comes out clean. Remove from oven and let cool for 10 minutes before serving. Enjoy! If you need the muffins to be vegan, make sure you use vegan chocolate chips. If you need the muffins to be gluten-free you can use all-purpose gluten-free flout. The muffins freeze well! 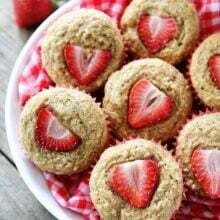 To reheat, place frozen muffins in microwave for 20-30 seconds. Quickly ripen the bananas in the oven 🙂 This is how I mostly do it when I need them darkened. I’ve never heard of this trick before! So awesome! Do you put the oven at any temp.? or do you just put the bananas in there and just leave them there for a few hours? Muffins for breakfast, aren’t they lucky! These sound amazing, I could eat a whole batch right now. To be honest I’ve never tried vegan chocolate: I wonder if it’s much of a difference. 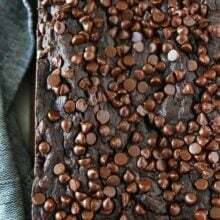 If you aren’t vegan, you can use regular chocolate chips! Hi. Instead of coconut oil, can I use olive oil or butter? I’m not vegan so I’m okay to use butter. Just need to know how much. Thanks! Yes, if you don’t need the muffins to be vegan! Enjoy! Wondering if I can use applesauce as substitute for the bananas as that many seems to much. Look delicious! I have only tried the recipe with bananas. hey Maria These look oh so good! I love chocolate to! Can every morning be a chocolate moment? These look delicious, Maria! I’m with your boys, I would want these every morning! This looks so good and its an excuse to try out white whole wheat flour. I think I will use canola oil and cheat using SWEETENED Almond Breeze Almond Milk! Sweetened works well too! Enjoy! these look wonderful! right up my alley! I love how mile high the muffins are and love that they’re made with almond milk!! No wonder your boys were super excited to try these muffins. It looks amazing. Since it is healthy, it’s gonna be mums favorite as well. The glaze on the muffins proves its freshness and softness. Superb!! Oh my goodness do these muffins look amazing! I typically don’t bake muffins because I’ve found some that I LOVE from the freezer section (veggie lite), but these look so good I may try them! I’m loving all the ingredients! everyone in my family loved these! thank you! Are you sure the measurements are correct or is there a ingredient missing. I mixed everything as per your recipe and my mix was so dry, I had to add another cup of milk in. Is this supposed to have eggs as well? What happens if you use regular cocoa powder vs dutch? I used Fry’s and it was fine. Dutch cocoa tends to have more flavour and is chemically neutral. It may have resulted in a chemical difference, but it was still delicious. Maybe flatter? Alter? So I comes out similar? Thanks a lot! Delicious! And super easy to make. Maria- I cannot thank you enough for posting vegan/dairy free options 🙂 these are perfect for my toddler who has a TON of allergies including dairy! I can’t wait to make them for Valentine’s Day breakfast! Wow!!! They look awesome! Was wondering if I could use oats flour instead of whole wheat flour. Will that give me the same result and will I have to change to cooking temp and time if I do use oats flour. I haven’t tried oat flour. It might make the texture a little different. I am guessing the baking time/temperature would be the same though. Let me know if you try it! I used oats flour, baking time was the same. These looks fantastic! I’m wondering if I can substitute Almond milk with regular 2% milk …. These were fantastic! I only used three bananas and added a touch more almond milk. Baked for 19 minutes and let cool in the muffin tins and they were perfectly done. I will definitely be making these again. These are amazing muffins! I didn’t have any flour so I ground up some oats in food processor and I used olive oil because I never had coconut oil. They are healthy and delish! Anyone know the nutritional value per muffin? Also I meant to rate this 5 stars! These were the best vegan muffins I’ve made! And I’ve tried many recipes! Thank you! I substituted soy milk As I didn’t have almond milk and they were great! Yay! Glad you enjoyed the muffins! Folded in some extra white chocolate buttons, it was delicious! 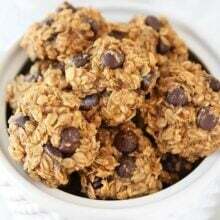 I used milk, 2%, olive oil, white flour and reduced sugar, added regular chocolate chips. Calories probably equivalent to recipe. They were beyond delicious! If you’ve ever tasted the large chocolate muffins from Costco, they are better plus you get a bonus of banana. Almost like putting a banana and chocolate muffin together. I am just not into the whole vegan thing but these muffins look yummy. So, can I use buttermilk as a substitute for the almond “milk”. Honestly, I just cannot do any of the “milks” that are really not milk at all…almond milk tastes like liquid raw almonds…not milk. I’m a proud supporter of chocolate for breakfast 🙂 These look delish!